- 2013/12/27: Fixed: Can't order sub categories of a category by configuration. - Fixed: Loading image doesn't appear when get videos and images. - Fixed: Get Images and Videos buttons are enabled again after finish getting data. 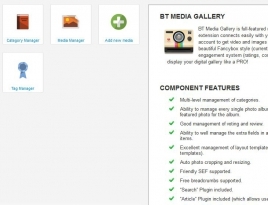 BT Media Gallery is full-featured multimedia component for Joomla. This extension connects easily with your YouTube, Vimeo, Flickr and Picasa account to get video and images files by some clicks. It's hard to resist its beautiful Fancybox style (currently use for Facebook) and its friendly User engagement system (ratings, comments, social media sharing). Let's display your digital gallery like a PRO! 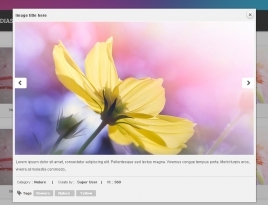 Uploading image is convenient because of BT Media Gallery can get images and videos from your computer folder and media content hosting such as Flickr, Picasa, Youtube and Vimeo. You can easily arrange media files by categories. Your media are gotten tags automatically while be embedding on YouTube and Vimeo. Social communication and user engagement is improved because the users can rate and comment as well as share on social networks for your media. This extension supports uploading by Flash & HTML 5. Flexible settings gives you freedom for displaying selected map functions, as well as grouping the large number of markers (marker cluster) and searching for location with filter (smart search). BT Media Gallery also support others extensions such as add-media-to-article plugin, Xmap, Smart Search… to optimize the usability of your website. You can upload images one by one or multiple images at once.